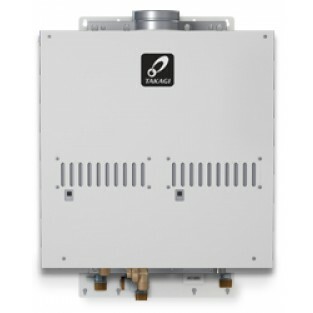 The Takagi T-M50-P Liquid Propane Indoor Tankless Water Heater is designed for residential and commercial applications. This model is loaded with features including freeze, surge and overheat protection. At 380,000 BTUs/hr maximum input, this tankless water heater can supply 6 showers simultaneously in warmer climates. It features an electronic ignition system and requires 5 inch diameter stainless steel vent pipe and can be vented either through the side wall or up through the roof. The Takagi T-M50-P can be installed outside also using the 9007677005 Outdoor ventilation cap. The TM-RE30 wired remote control is an optional accessory. Takagi gas tankless water heaters are warranted by the Manufacturer (Takagi) through Takagi Corp. will furnish a replacement heat exchanger and will furnish a replacement of any other part which fails in normal use and service within the applicable periods specified below, in accordance with the terms of this warranty. The Takagi Corp. replacement will be warranted for the unexpired portion of the original warranty. If the heat exchanger fails within Fifteen (15) years after the original installation and operation, Takagi Corp. will furnish a replacement heat exchanger. However, if the water heater is used within an approved hot water recirculation and supplied with circulated water, this heat exchanger warranty is limited to ten (10) years from date of original installation and operation. If the water heater is installed in other than a single family dwelling, commercial use or used for heating applications this heat exchanger warranty is limited to ten (10) years from date of original installation and operation. 6. to damage resulting from scale deposits and/or highly mineralized / unsoftened water supply. If any other part fails within five (5) years after original installation and operation, Takagi Corp. will furnish a replacement part free of charge. The manufacturer will provide for reasonable labor charges associated with warranty repairs or replacements within one (1) year from the date of purchase. The manufacturer will only pay directly to the service provider. Additionally, all warranty claims and warranty service must be authorized and approved by the manufacturer. The damaged or defective item must be made available in exchange for the replacement. No one is authorized to make any other warranties on behalf of Takagi Corp.. It is expressly understood that the replacement warranty of Bosch Thermotechnology Corp. shall be in lieu of any and all other warranties, express or implied, including warranties of merchantability or fitness for a particular use or purpose, and further that Takagi Corp. shall not be liable for any loss or damage directly or indirectly arising from the use of the hot water heater, or for any consequential damages arising from such use (including damages from water leakage). Takagi Corp. sole liability with respect to any defect shall be for the replacement of the defective part(s). Some states do not allow such limitations and exclusions, so the above may not apply to you. This warranty gives specific legal rights. You may also have other rights which vary from state to state.